Let’s get one thing out of the way right now: I’m squeamish. So I didn’t know if I’d be able to watch a film about a group of first year medical students navigating their gross anatomy class. 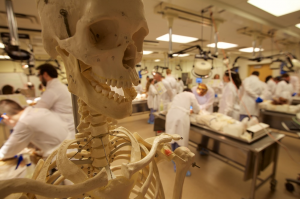 But one of the things I think director Chip Duncan illustrates so beautifully isÂ theÂ passion and commitment ofÂ theseÂ students to study the human body and learn from the people who have donated their bodies to science. And I didn’t expect to come away from this documentary having discovered theÂ beauty and wonder ofÂ theÂ human form. 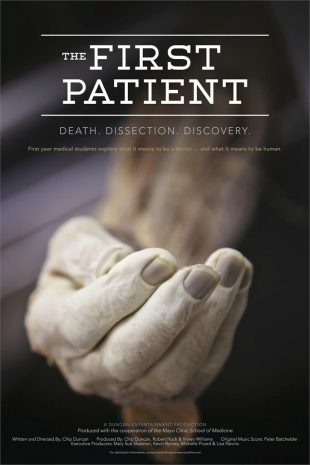 AÂ dramatic journey into an unknown world, The First PatientÂ challenges audiences to embrace their curiosity and courage.Â With extraordinary access and assistance provided by theÂ Mayo Clinic, Duncan brings his cameras intoÂ aÂ worldÂ theÂ public rarely sees. The First PatientÂ provides dynamic insights into medical science, teamwork, death, and spirituality as students discover what it means to beÂ aÂ doctor and what it means to beÂ aÂ human being. I had the chance to speak exclusively to director Chip Duncan about why he wanted to make this film, how he ended up at the Mayo Clinic medical school, the journey of the students and the beauty of the human body. TV GOODNESS: I was apprehensive to watch this, but I found the film so interesting and educational and beautiful. What made you want to make this film and how did you start going about it? Chip Duncan: “Well first of all, thank you for that comment. I’m really glad, â€˜cause it’s a topic where you think this can’t possibly be upbeat and positive and then you watch the film and it is. You think it’s going to be scary and then it’s not. 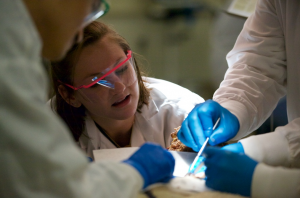 Let me put it this way, it originated when I visited an anatomy lab for the first time in 2003. The lab was down in South Carolina at a medical school and it was run by a friend of mine. When I went into the lab for the first time, I said, â€˜Well I’m either going to pass out or I’m going to want to make a film.â€™ And the magic happened. I got inside and realized that the donors had made this incredible sacrifice of their bodies for medical science. But the journey was all about the students, about their growth, overcoming their fear, learning the confidence that it takes to be a doctor. Then I started doing some homework and I found out that my experience was not unique. That this class for hundreds of years has been really the defining opportunity for someone to become a doctor. If they can’t get through this class, they won’t pursue the profession. You have no choice. They call it a rite of passage and it truly is. TV GOODNESS: When you decided you wanted to make the film, how did you go about picking the hospital? What was that process like? And then how did you pick the students you wanted to talk to? Duncan: “A number of schools turned us down. In a meeting with Mayo Clinic, they said yes almost immediately and I think a lot of it has to do with Mayo’s dedication to education. In this case, they thought it would be not just educating the students, but also educating the audience [with] an underlying goal of the more we understand, the more we see what a doctor goes through, what their trainingâ€™s like, the better we might become ourselves as patients. Mayo has this big commitment to education and, I think, because of who they are, they’re willing to take more risks. They’re very courageous. The First Patient opens in New York on Friday, October 26th and will rollout throughout the US this fall.